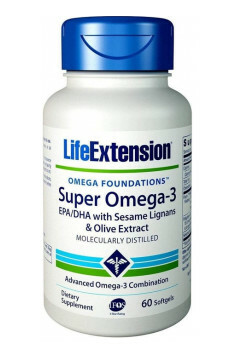 Life Extension Super Omega-3 is a dietary supplement, enriching a diet in unsaturated fatty acids EPA and DHA. They are accompanied by olive extracts and lignans from sesame seeds, which strengthen the activity of omega-3 fatty acids and at the same time increase the benefits from supplementation. The preparation is in the form of softgels, which eliminate the risk of digestive discomfort. The supplement is conducive to maintaining optimal physical and mental condition and has wide application in the prophylaxis of many diseases. It decreases the risk of cardiological diseases, supports the functions of the immune system and improves cognitive abilities. It positively influences mental well-being - strengthens mood and reduces the symptoms of depression. The richest source of omega-3 acids are fish. Unfortunately, oil obtained from them is often contaminated with heavy metals, parabens and toxins, which are present in seas and oceans. Health value of such oil is scant as along with pro-health fatty acids it provides many other substances which are dangerous to heath. The company Life Extension faced these problems. The supplements of this company are based on fish widely living in pure waters of Alaska. The processing of fish oil is carried out with the use of the most recent technological advancements. Thanks to this, it is possible to remove all potential contaminations and achieve maximal concentration of active compounds, i.e. DHA and EPA acids. In the presented supplement, apart from omega-3 fatty acids there are also olive oil extract and lignans from sesame seeds. Olive oil is primarily the source of precious polyphenols, which strengthen the activity of unsaturated fatty acids. Lignans, in turn, play the role of the antioxidant - they inhibit oxidation processes and increase stability of omega-3 fatty acids in the organism. Omega-3 fatty acids - are the compounds from the group of essential unsaturated fatty acids (EFAs). They include: alpha-linoleic acid (it appears in linseed and rapeseed oils), eicosapentaenoic acid (EPA) and docosahexaenoic acid (DHA), which may be found in cold-water oily fish. EPA and DHA are characterized by the highest biological activity and they have real influence on the metabolic functions of the organism. DHA primarily plays the role of a building block - it is present in cell membranes, brain, eye retina and heart. EPA, in turn, conditions the synthesis of the so-called eicosanoids, i.e. tissue hormones, responsible for maintaining homeostasis of the organism and optimization of development processes. Omega-3 fatty acids constitute an important element of prophylaxis of cardiovascular ailments. They influence the majority of parameters, which play a key role in the etiology of atherosclerosis, coronary artery disease, stroke and heart attack. Increasing the supply of omega-3 fatty acids is conducive to optimization of lipid profile. They help to reduce the concentration of unbeneficial triglycerides and problematic LDL fraction of cholesterol. At the same time, they promote the increase of the “good” HDL cholesterol. Omega-3 fatty acids have anticoagulant properties. Their activity on this field is supported by olive leaf extract and especially oleuropein contained there. These substances inhibit the production of prothrombotic compounds and accelerate the pace of fibrin breakdown. Thanks to this, the tendency of platelets to form dangerous clots is limited. Omega-3 fatty acids improve the functions of blood vessel endothelium and decrease the amount of noradrenaline in the plasma, which prevents hypertension and facilitates maintaining proper values of blood pressure. Moreover, it was proven in the studies that omega-3 fatty acids promote the creation of new blood vessels after strokes and heart attacks. The response of the immune system and its ability to protect the organism from pathogens is conditioned by the activity of leukotrienes. They belong to the group of eicosanoids and are produced from EPA. Disorders in their synthesis as a result of EPA deficiency will be reflected in immunity impairment. Omega-3 fatty acids are recommended to people with autoimmune diseases. DHA and EPA induce apoptosis of autoreactive lymphocytes T and decrease the amount of antibodies produced in the organism, which is often sufficient to slow down the development of the disease and decrease the intensity of symptoms. Omega-3 fatty acids have important influence on regulating the work of the nervous system. They influence both mental well-being and cognitive ability. DHA acid is conducive to the development and growth of nerve cells. Moreover, it is a structural component of cell membranes, which conditions appropriateness of signalization and proper nerve transmission. Omega-3 fatty acids are also a substrate in the process of production of two important compounds, i.e. serotonin and dopamine. They are responsible for mood and general attitude to life. Specialists suggest to permanently introduce omega-3 fatty acids to the diet of physically active people. They may shorten the time of post-workout recovery and improve its effectiveness. They demonstrate strong anti-inflammatory and immunoregulatory effect, stimulate repair processes in the area of damaged tissues. To sum up, Life Extension Super Omega-3 is the best choice when it comes to complementing diet in omega-3 fatty acids. Active compounds contained in the preparation come from a safe source and additional components strengthen their activity and improve effectiveness of supplementation. The preparation is especially recommended to pregnant women, seniors and people who deal with the metabolic syndrome. A common problem in supplementation with omega-3 fatty acids is unpleasant “burping”, which accompanies the application of tablets. The supplement is in the form of softgels and is appropriate for people with sensitive digestive system. In order to decrease the risk of digestive discomfort even more, the capsules may be swallowed during a meal. The supplement should be stored in a sealed container, away from the sourced of light and heat. highly refined fish oil concentrate (Alaska Pollock), gelatin, glycerin, purified water, silica, natural flavor, sunflower lecithin, caramel color, mixed tocopherols, rosemary extract, maltodextrin. Contains fish, crustaceans (krill) and sesame. Coenzyme Q10 prepared specially for children. Delicious raspberry chewing tablets. Supplement that contains caffeine, theobromine and polyphenols. It improves concentration and reduces fatigue.